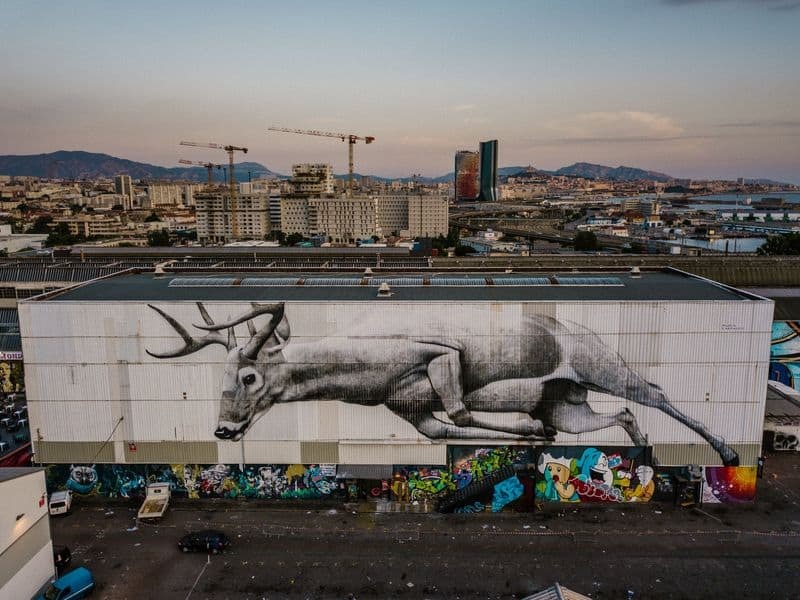 Street Art Takes Over Marseille! 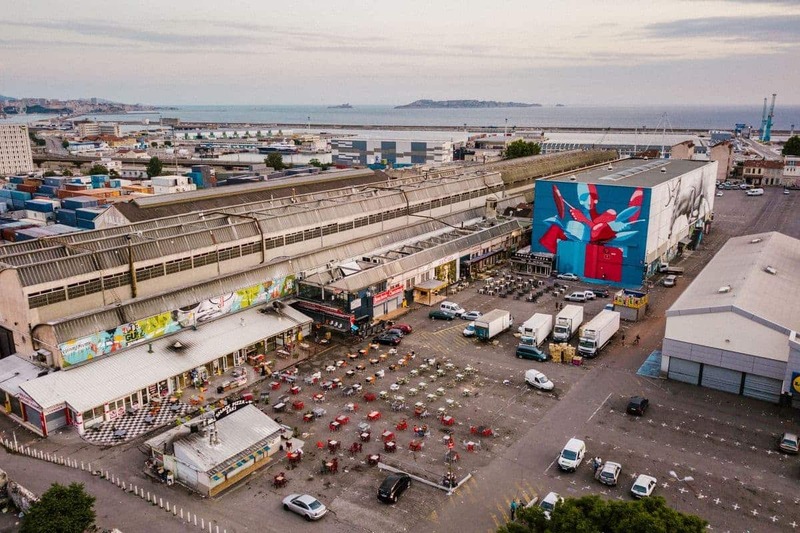 Hosted by Galerie Saint Laurent, the Marseille Street Art show aims to adorn 9,000 m2 surfaces of the famous Marseille flea market with murals created by acclaimed street artists from all around the world, making this place the largest European street art site! 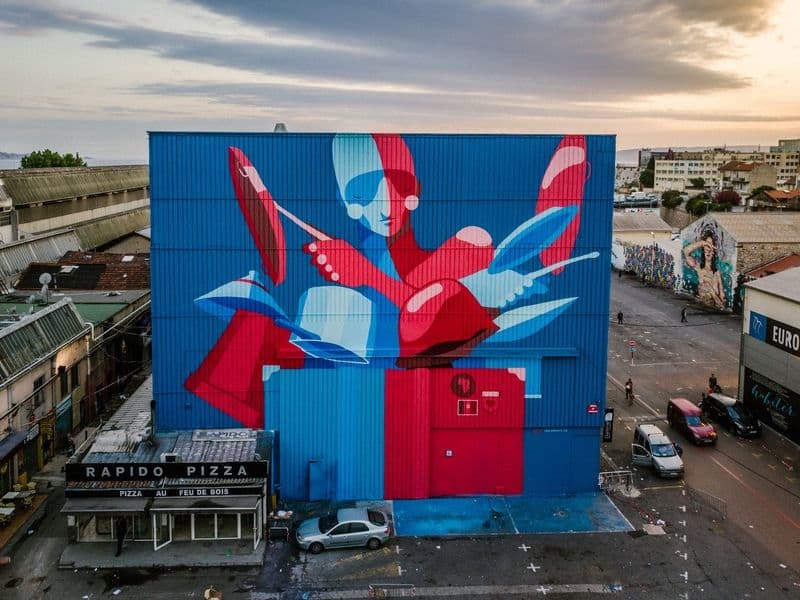 Coming back for the fourth time, this year the Marseille Street Art Show has teamed up with the festival IPAF (International Public Art Festival), giving an international and multicultural dimension to the event. 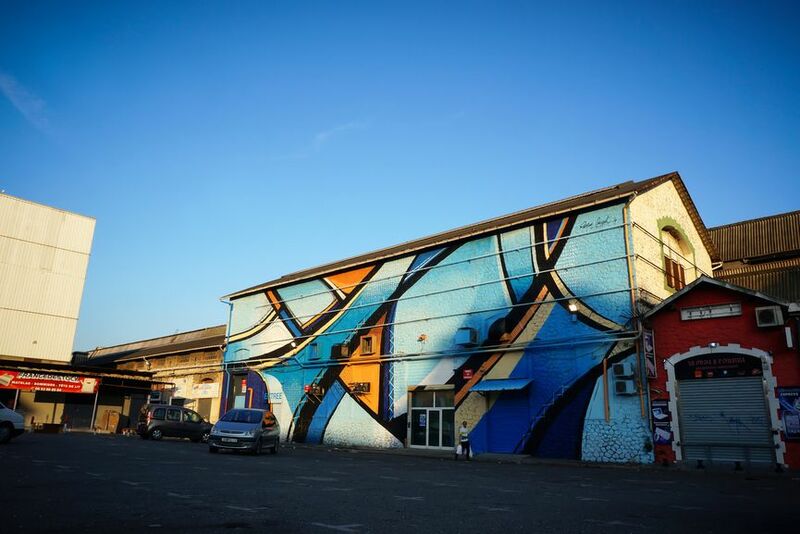 This year’s edition welcomes eight international artists who will create monumental murals in the heart of the flea market. 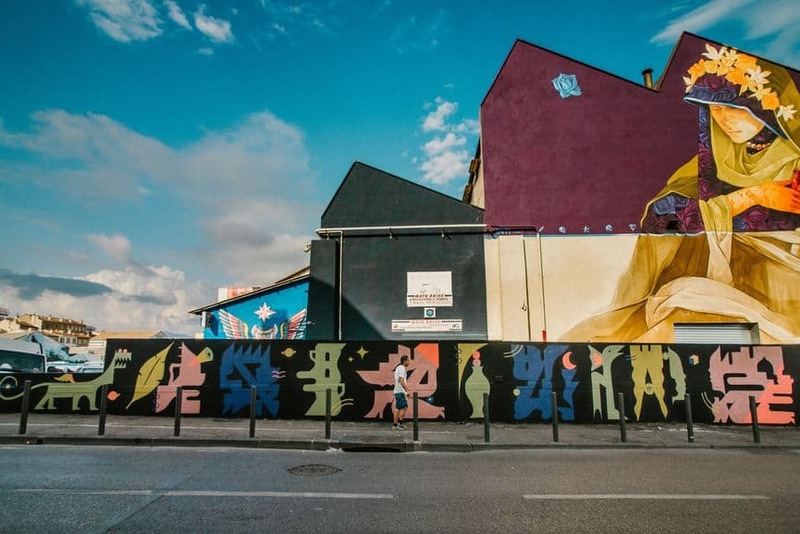 During the residency that started on May 1st, they have already created works on 5,000m² of facades, adding to the 4,300 m2 of works created during the previous editions of the festival. This year’s artists are Amose, Zesar Bahamonte, Ruben Carrasco, Romain Froquet, Goddog, Mahn Kloix, Theo Lopez and Joachim Romain. The public can already enjoy finished pieces by Amose, Goddog, Ruben Carrasco and Zesar Bahamonte. In addition to the mural work, these artists have created canvases that are currently on view at the Hall des Antiquaires of the flea market. The practice of the street artist Amose is focused on the human body. By adding shapes, patterns, flowing lines and intermingling, Amose deconstructs it, creating work that is both dynamic and abstract. Coming from Seville, Zesar Bahamonte creates work characterized by light forms and vibrant colors. The protagonists of his works are engaged in dancing, music and sincere communion. A Mexican-Canadian artist based in Montreal, Ruben Carrasco is known for work created in multifaceted techniques and styles. 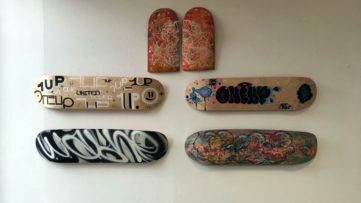 He has also worked as a tattoo artist, set designer, muralist, photographer, graphic designer and digital artist, all contributing to his present visual language. Experimenting with various media, Romain Froquet creates work inspired by ethnic art and the urban universe. His singular pictorial language is a reflection of his subconscious. A self-taught artist from Avignon, Goddog is known for works that are abstract, geometric, organic, always precise and rich in composition. He finds inspiration in travels, dreams and reading. Paris-born and Marseille-based artist, Mahn Kloix travels to countries that have experienced major uprisings and adorns the streets with their protagonists. In recent years, the French artist Theo Lopez gravitated towards abstraction. 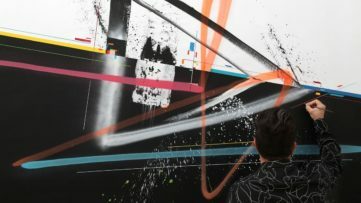 Returning to the basics, to the essence of his line, he developed a unique visual language characterized by both reflection and spontaneity. Living and working in Paris, Joachim Romain explores the concepts of temporality, urban environment and mass consumptions. Sensitive to environmental issues, he often conceives his pieces from recycled materials. La grande Halle is a symbol of the Galerie Saint Laurent, allowing exhibitions to be held bringing together many artists, just like an art center. Initially created by artists as an international festival of contemporary muralism that celebrates the dreams of the people of Hollbox Island in Mexico, IPAF continues to expand its influence, with its last edition being held in Cape Town, South Africa. 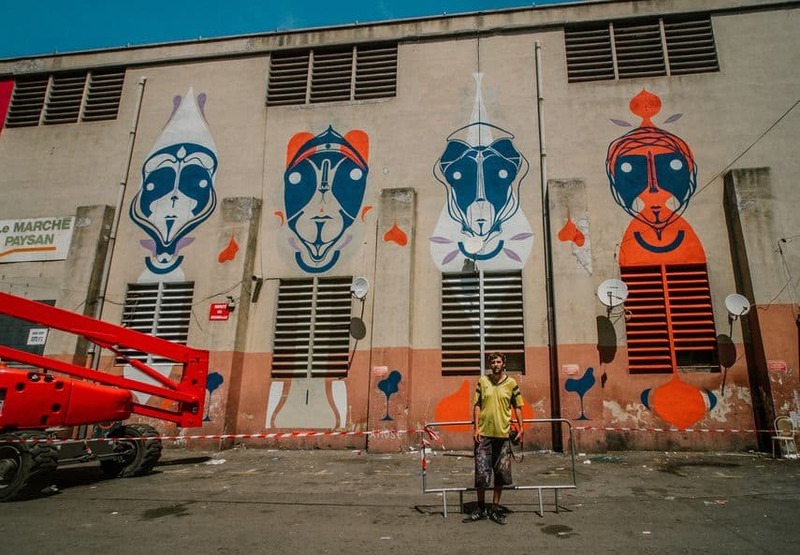 The Marseille Street Art Show #4 will take place until July 31st, 2018, while the exhibition will be shown at the Halle des Antiquaires at the Marseille flea market. 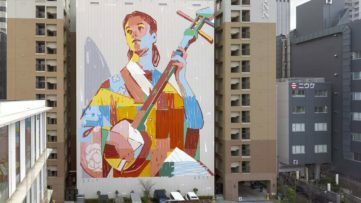 Featured image: Ipaf Msas, photo by Yoshi Yanagita; Romain Froquet Mural; Goddog – Ipaf Msas, photo by Yoshitaro. All images courtesy of Marseille Street Art Show.